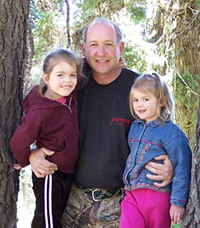 Peter F. Kolb is the Montana State University Extension Forestry Specialist and an Associate Professor of Forest Ecology & Management, housed at the University of Montana in the Department of Forest Management. He has recently been selected to be a Fulbright Scholar to the Bavarian Institute of Applied Forestry in 2008 where he will be lecturing on forest ecosystem processes and studying the long term effects of intensive forest management in the northern Alps. For the past 23 years he has studied forest ecosystem function and dynamics with specific interest in the role of disturbance processes across Idaho and Montana. . Specific research emphasis have included the effects of heat, water stress and grass competition on conifer seedling establishment, the role of soil characteristics, forest pests, pathogens and wildfire on forest species and succession dynamics, the impacts of forest thinning on root diseases, woody debris treatments and their effects on forest and range restoration, cultural practices to enhance woody debris decomposition, and plant community recovery following wildfires and salvage logging. During the past 10 years he has worked extensively with private forest landowners and managers on forest assessment and management plan development, silvicultural alternatives, wildfire hazard reduction, and post-wildfire rehabilitation. He also directs the Montana natural Resources Youth Camp and works with farmers and ranchers across central and eastern Montana on planning, establishing and maintaining windbreaks and shelterbelts. His past work experience includes time as an inventory forester for the Wisconsin DNR, an assistant tree nursery manager for Champion International, a fire lookout/fire fighter for the USDA Forest Service and an applied forester for Boise Cascade. In his spare time Peter is either building furniture, working on his small Tree Farm, with his horses, or hiking, hunting and camping with his family. Kolb, Peter F. 2006. Effects of wildfire severity and salvage logging on natural vegetation and native tree seedling recovery following the wildfires of 2000 in the southern Bitterroot Valley, Montana. Testimony before the House Resources Committee, Subcommittee on Forests and Forest Health Oversight Hearing – Medford Oregon on behalf of the Society of American Foresters. Kolb, Peter F. 2005. Testimony for the Society of American Foresters on the efficacy of HR4200 Forest Emergency Recovery and Research Act before the House Resources Committee, Subcommittee on Forests and Forest Health, Washington D.C.
Kolb, Peter F. 2005. Vegetation Recovery across Wildland Fire Severity Gradients in Western Montana. Fall 2005 Eco-Report, Bitterroot Ecosystem Management Research Project, USDA Forest Service Rocky Mtn Research Station. Fall, 2 pgs. Justice, Michael and Peter Kolb. 2004. Call Before You Cut: A Resource Guide to Forest Management. MSU Extension Publication #4459. Kolb, Peter. 2004. Restoring an old-growth larch forest: Seth Diamond Forest Discovery Site Posters. 10 advanced topic educational posters. Kolb, Peter. 2004. Red Trees Across Montana – How bark beetles can affect your forest. MSU Extension Misc. Publication. Kolb, Peter F. 2003. Montana Governors Briefing on Forest Health and Wildfires. 15 pgs. Kolb, Peter F. 2003. Editor of “The Governor’s Conference on the Future of Montana Forests”. Montana Forest and Conservation Experiment Station publication. 78 pages. Kolb, Peter F. 2003. Breakout group summary. IN: Governor’s Conference on the Future of Montana Forests. Montana Forest and Conservation Experiment Station publication. Pgs 60-62. Kolb, Peter F. 2002. Montana NIPF Landowner Issues. Proceedings and Presentation. Northwest Private Landowners Conference, Moscow Idaho. Kolb, Peter F. 2002. Tree and Forest Restoration Following Wildfire. In: After Wildfire, Information for landowners coping with the aftermath of wildfire. James Knight, Editor. Montana State University Extension Service Publication. Pp. 15-20. Law, Darin and Peter Kolb. 2001. Restoring range plant communities on conifer encroachment affected lands in central Montana. Paper and abstract. Society of Range Management Annual Conference, Kailuha, Hawaii. Kolb, Peter F. 2001. Assessing wildfire affects and restoration treatments. Proceedings and Presentation for Montana Nursery Growers Association. Billings, MT. Kolb, Peter F. 2001. Fires 2000 across Montana, What did we learn? Proceedings and Presentation. Northwest Private Landowners Conference, Moscow Idaho. Kolb, Peter F. 2001. Carbon sequestration in forests, facts and figures. Montana Forest Owners Association NIFTY Notes. Kolb, Peter F. 2001. Pruning Storm Damaged Trees. MSU Extension Misc. Publications. 12 p.
Kolb, Peter F. 2001. Tree and forest restoration following wildfires. Horticultural Inspection Newsletter. January 2001, Western Chapter. Schmidt, Lisa and Peter Kolb. 2001. Timber! Learning how to log your forest. Farmer-Stockman, Sept. 2001. pp 12-19. Kolb, Peter F. 2000. Managing your timber resource, which tree to cut which tree to leave. Misc MSU Extension Publication. A proposed model for carbon sequestration from managed forests. Western States Carbon Sequestration conference, Spokane Wa. January 25-26, 1999. Forestland Grazing: Understory forage management. NIPFty Notes, Summer 1999. Montana Forest Owners Association Newsletter. Mikkelson, Martha, Peter Kolb, and Chris Onstad. 1998. Growing Spruce Trees in Montana. MSU Extension Service Publication A-13, Montana State University, Bozeman, MT. Watershed responses to deforestation in Central Montana, A case study. NIPFty Notes, Summer 1999. Montana Forest Owners Association Newsletter. Pruning trees after the Storm, Fergus County Extension September Newsletter, 1999. Kolb, Peter F., David L. Adams and Geral I. McDonald. 1998 Impacts of Fire Exclusion on Forest Dynamics and Processes in Central Idaho. Pages 210-218 in Teresa L. Pruden and Leonard A. Brennan (eds.). Fire in ecosystem management: shifting the paradigm from suppression to prescription. Tall Timbers Fire Ecology Conference Proceedings, No. 20 Tall Timber Research Station, Tallahassee, FL. Kolb, Peter F., David Adams and Geral McDonald. 1996. Ecological processes associated with forest health and fire susceptibility concerns. Abstract and guest speaker for The Annual Interior West Fire Council Meeting, in Saskatoon, Saskachewan, Canada November 1996. Kolb, Peter F. and Ronald Robberecht. 1996. Bunchgrass competition effects on Pinus ponderosa seedling establishment. International Journal of Plant Sciences 157:509-515. Kolb, Peter F. and Ronald Robberecht. 1992. Natural regeneration of ponderosa pine: Mechanisms of seedling survival. Focus; Research at the College of Forestry, Wildlife and Range Sciences. Kolb, Peter F. and Ronald Robberecht. 1992. The effects of water stress on thermal tolerance of Pinus ponderosa seedlings. Abstract and poster. Ecological Society of America national meeting, Honolulu, Hawaii, USA, 1992. Kolb, Peter F. and Ronald Robberecht. 1991. Bunchgrass competition and environmental stress effects on Pinus ponderosa seedlings. Abstract and oral presentation. Ecological Society of America national meeting, San Antonio, Texas, USA, 1991.